Trick or treat? You couldn't quite make it up. It is approaching 03:00 GMT - it's weird enough at this time of day to be about to see Theresa May speak. And the new Brexit deadline is, you guessed it, Halloween. But in its simplest sense, the prime minister asked for a delay so that she didn't open Pandora's Box. It's longer than those who wanted a short delay hoped. So there won't be immediate pressure on the prime minister's current plan (which might be a vain hope) of getting out of this - finding common ground with the Labour party. 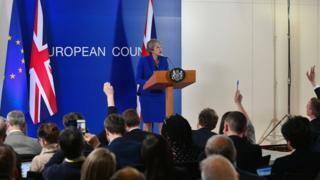 And with only limited expectations for that process anyway, it's likely sooner or perhaps later that the prime minister will be back in Parliament again asking MPs to coalesce around an option that could command a majority that could last a while. Again, without time pressure, it's not clear why Parliament would suddenly be in a rush to agree. That's why it's not entirely surprising to hear the EU Council president warn minutes after the agreement that the UK must not waste the extra time it's been given. That's why, potentially, an election might become the way out that few want is still possible. And don't be in any doubt that those in Parliament and outside pushing for another referendum, or to stop Brexit altogether, will use this opportunity to make their case more and more loudly. Even before the official confirmation of the decision came, one minister got in touch to say that now the prime minister can stay on "in name only" with a leadership contest getting going as early as just after Easter and a new leader in place by early summer.